We’d love your help. 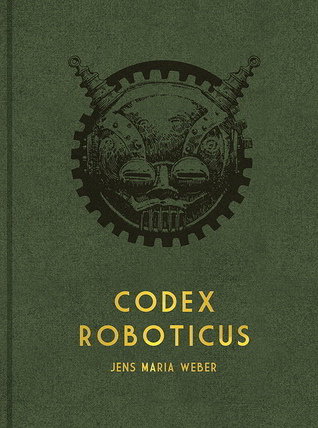 Let us know what’s wrong with this preview of Codex Roboticus by Jens Maria Weber. Sind die Menschmaschinen des deutschen Arztes Stanislaus Schwenck die Fantasie eines Morphiumabhängigen oder Teil eines tatsächlichen Geheimprojekts aus den 20er Jahren? (http://d Sind die Menschmaschinen des deutschen Arztes Stanislaus Schwenck die Fantasie eines Morphiumabhängigen oder Teil eines tatsächlichen Geheimprojekts aus den 20er Jahren? To ask other readers questions about Codex Roboticus, please sign up. I got a free copy of Codex Roboticus in the mail that i won in the Goodreads contest http://www.goodreads.com/giveaway/sho... and it ROCKS, I'm so glad i was picked for this! So COOL!! The art is sweet and its cool in German with English translations. I will be watching for their future #Kickstarter or #Indigogo project for sure. I wanna keep reading and looking at the awesome art work. What captivating artwork, I was absolutely mesmerized by it! I also noticed the minimal use of narration and after lengthy contemplation, decided that it was an influential element to the dark charm of this book. It’s one of those books I will pick up time and again just to search out new details that I missed before. This book is a great work of art. It is hard back with very good quality thick paper. The illistrations are great and the translations appear to be correct, with most of the book in both German and Enlish. I still am unsure if this a real project or if it was just the imaginative work of Schwenck. I received this book from Goodreads.com Giveaways. This book has amazing art! If H.R. Giger drew a steam punk world, this what I would compare it to. The narrative is a little weak and confusing at times, but overall this a quick and entertaining book. The quality of book is very good! A hardcover, the paper, perfect! German/English edition, the book is about a secret project of 1920s. Many photos, illustrations and documents from letters, notes and prophecies of Dr Stanislaus Schwenck. Non-fiction, Codex Roboticus is recommended and may be interesting for everyone who enjoys the mysteries about the sombre atmosphere of post-war Germany.